Panama City meant one thing to us: the Canal. Transiting it was our major goal for this year, so I did not give the city itself much thought. We ended up staying there much longer than we anticipated (see rock post) and decided to embrace the opportunity to explore this historic city. So cue the skyline, public transportation and museums because we were back in a real honest to goodness big city! And just like every metropolitan area you get the good with the bad, so we dusted off those NYC street smarts, threw our Panama hats in the air and enjoyed every second of city living. Open just two months, Panama’s new Metro was a terrific way to get around town. Metro, 35¢ a ride, what a bargain. Old “Canal Zone” housing now stands empty. and part bustling port city that, of course, centers around their main cash cow, the Canal. Oh and lest I forget malls. Shopping seems a national sport here. Panama City hosts 4 ENORMOUS malls both high and low end. I’m not a shopper, but did enjoy the air conditioning and cheap swimsuits, otherwise they just seemed like a labyrinth of the usual suspects, ubiquitous food courts and multiplex cinemas. But the main transit center is at one of the malls, so you always had to pass through on your way to everything else. Lots of stray cats, cared for by locals. Peter’s new bud we met in Casco Viejo. He was born in the Canal zone and had LOTS of stories. No, I didn’t bring this one home, just gave her some love. Older you say, you want to see older than 1673. Alright, Panama Viejo is for you. This was the original Panama City founded in 1519 before it was shifted to Casco Viejo. Now they are just ruins which are incorporated into a museum and park. And of course we ate and drank and watched more soccer during the World Cup than we had in our entire lives. Lucy has had enough soccer to last a lifetime. Oldest cafe in Panama City (Est. 1875) Classic rice and beans and excellent coffee. That cat slipped in the door right after I took this photo. Patrons in Coca Cola cafe, they were right out of central casting. We had a great lunch here. Vendor selling spicy quail eggs. They were good, tasted like mini hard boiled eggs with a kick. Lung Fung Chinese restaurant. Delicious. Las Bóvedas restaurant in the vaults of the old customs building. We hiked off all that food and booze in rain forests and parks throughout the city. This is a good example of the 18′ tides they have on the Pacific side of Panama. This will all be underwater at high tide. And of course we went to the Panama Canal Museum and Miraflores locks to get an education on what was in store for us!!!! Panama Canal, here we come!!!! 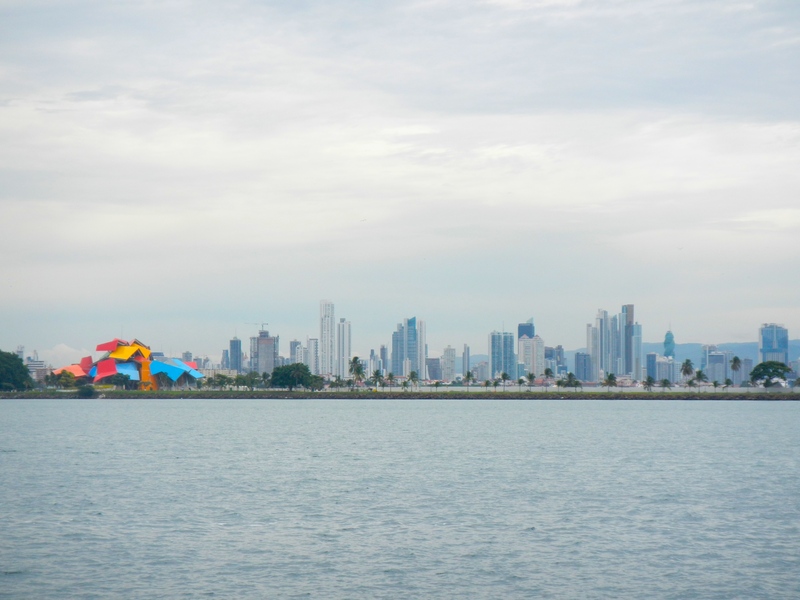 This entry was posted in City overview, Panama by Mary. Bookmark the permalink. Great post! Such an incredible year you are having! totally fascinating Mary! Hello from Laguna Beach. Haven’t thought of going to Panama but your photos and comments are enticing. I look forward to your blogs and photos. Great post. We’re looking forward to seeing Panama soon. What’s your routing plan for the Caribbean? Colombia to the Windwards or north to Mexico?